Its New Years Eve! Is anybody else excited to move away from 2014? This year has been really crazy and personally I'm looking forward to starting over again. Who is with me? 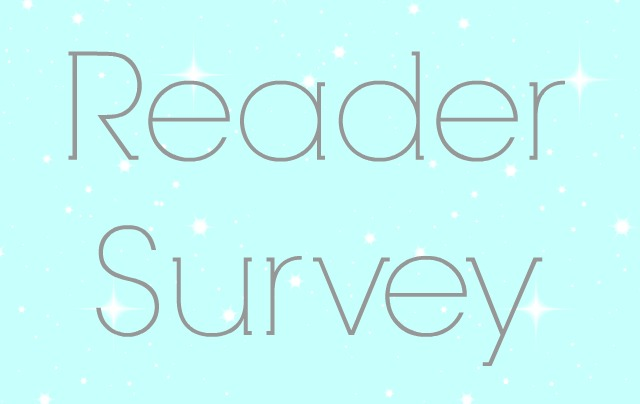 As you can tell by the title of this post, I'm conducting my first reader survey for the blog. I had the blog for about three years now and have never felt the need to conduct a survey. However, one of my goals for the new year is to really grow the blog into something more professional and possibly turn it into a career. So with a bunch of business classes and one good marketing class under my belt, I thought conducting a survey would start me off in the right direction of ''changing'' the blog. In the survey, there are 10 short questions which are mostly multiple choice. The survey covers a variety of topics about the blog, so you will be able to give your opinion about almost everything (like blog posts and even the blogs layout). Thank you in advance for sharing your thoughts and taking the time to complete the survey. Your answers will really help me to create better blog content and to make 2015 a better blogging year! p.s In a later blog post I will share the overall results from the survey.